Lisango Lezulu (Heaven's Gate) Lodge at Royal Jozini - Lavumisa Accommodation. On the slopes of the Lebombo Mountains in the soon-to-be Big 5 designated area of the Royal Jozini Big 6 Reserve, Lisango Lezulu has breath-taking views over the valley and to the Jozini Lake in the distance. With a cool breeze in summer on the mountainside, the lodge's four bedrooms are all placed for different views, whether it is looking at the mountain range, or to the nearby ravine, or down the face of the mountains, each one is a spacious, separate retreat built around the boma area. Designed in the style of farm homesteads at the turn of the last century, with balconies to shelter from the sunshine, this lodge's main living area has a modern open plan kitchen with dining area, lounge with 3D TV (full DSTV bouquet) and a covered patio, with expansive views to the water. There is a walk in pantry, separate scullery and guest cloakroom. 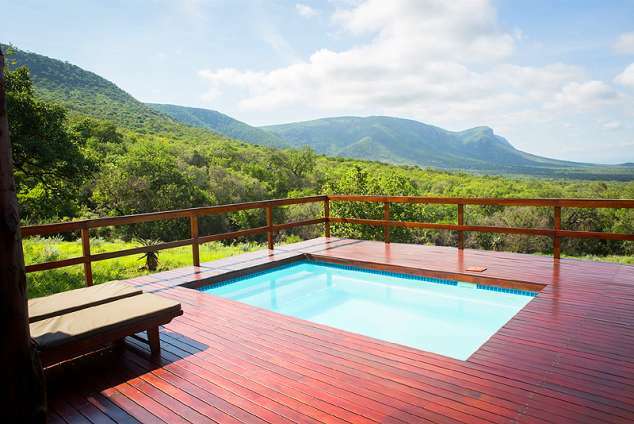 The four twin bedrooms are in separate cottages with their own private decks and en suite bathrooms. There is a pool and a high viewing deck and sheltered boma for around the fireside chats. Lisango Lezulu Lodge also provides a daily housekeeping service. Should guests require Internet or cell coverage, "Roaming" will need to be arranged before departure. Go back in time to when life was less rushed, less pressured. Take a peek at heaven. 2976 page views since 26 May, 2015.